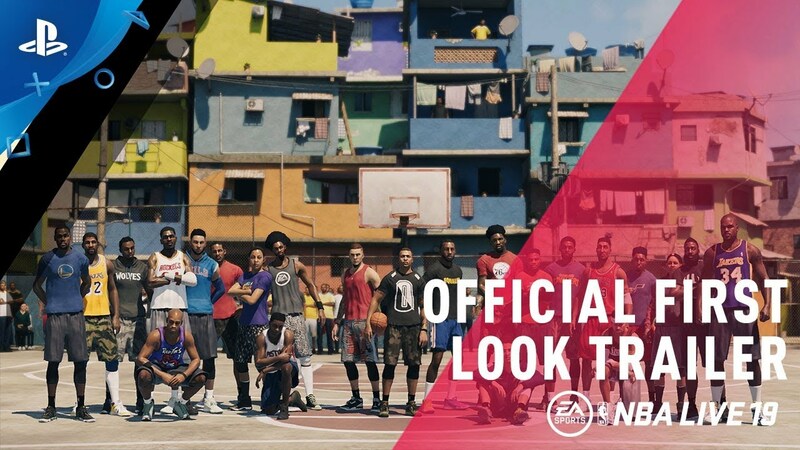 Show off your signature style on courts around the world as you earn the respect of NBA stars, legends, and icons who join your squad on your journey to be THE ONE in The League and The Streets in NBA LIVE 19. Continue your journey to be THE ONE in NBA LIVE 19 and progress through an all-new narrative, guided by expanded tools and strategies when building your player, with more courts to dominate across the globe. Build your squad and defend your court within an expanded, quest-driven journey for you and your recruited teammates to explore and progress. Compete on courts around the world against new players and legends who join your squad after you've beaten them. Level up and unlock new hero abilities for you and your teammates for more playstyle customization and game-changing skills. Customize your player with even more options for self-expression. Define Your Story as you start from High School and progress to legend status on courts in THE LEAGUE and THE STREETS. Increase your stock in performance driven challenges and learn mechanics from iconic players as you rise to stardom. Relive your best and worst moments through Modern Highlights as notable basketball influencers and celebrities mark your achievements on the court. Share in the excitement and disappointments throughout your career reflected by your peers, top streamers/influencers, notable media outlets and ESPN personalities. Live your NBA dream within an authentic, solo-career experience. Get drafted and learn what’s it’s like to be an NBA prospect, facing challenges and opportunities as you choose your destiny. Venture beyond The League and into The Streets where the rules and how you earn respect, are different. Play solo, multi-player, or co-op experiences in some of the most storied courts and venues in the world. Change game momentum on every possession with more 1v1 control and responsiveness in all on-ball opportunities and interactivity against your opponent. Just like the best players in the NBA, take control and be aggressive on both sides of the ball to create more space between you and your defender to get open and swish threes or lock down opponents and swat the ball to force a turnover on defense. Reimagined animation pipelines and player models redefine every move you make with more authenticity, mobility and responsiveness. All new animation sequences and signature styles replicate the movements and mannerisms of your favorite NBA greats providing you with a vast variety of player animations and smooth transitions across the court. From pulling a mid-range basket and dribbling to aggressive defense and post whistle player reactions. Every Game Feels Different. Influence the entire game as your behavior and attitude on the court affects how your teammates and opponents react. Hype up your squad or intimidate opponents and their fans. You want to try and lock down Westbrook? Be prepared for him to come at you. Trying to dunk on players can make you a target for hard fouls, heated exchanges and trash talk. NBA players react just like their real-life counterparts, bringing in a new level of emotion and realism into Sports games. The action doesn’t end after the whistle, so don’t let the sideline stop you! Interact with the bench, taunt opposing players, chase the ball into crowd, go hard to the hoop or earn the respect of the crowd, triggering them rush the court after one of your epic plays in The Streets, blurring the lines between what happens on and off the court. Discover hundreds of hours of new commentary and weekly updates throughout the year to keep each game fresh and exciting. The all-new commentary duo featuring Ed Cohen, voice of the New York Knicks and former Chicago Bull Jay Williams bring you the latest content from around the NBA, Summer Pro-Ams, and global basketball events. Candace Parker joins the squad in NBA LIVE 19! 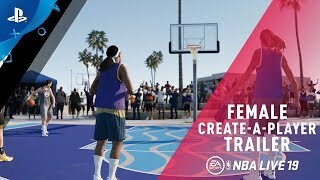 EA SPORTS introduces the ability to create Female players in NBA LIVE 19. With gameplay innovation including Real Player Motion Tech and new ways to develop your player, NBA Live 19 is the most authentic and responsive experience in franchise history. CONDITIONS AND RESTRICTIONS APPLY. SEE www.easports.com/nba-live/disclaimers FOR DETAILS.